There are fun and easy-going co-op games, there are challenging co-op games, and then there are truly brutal co-op games that strain you and your party. 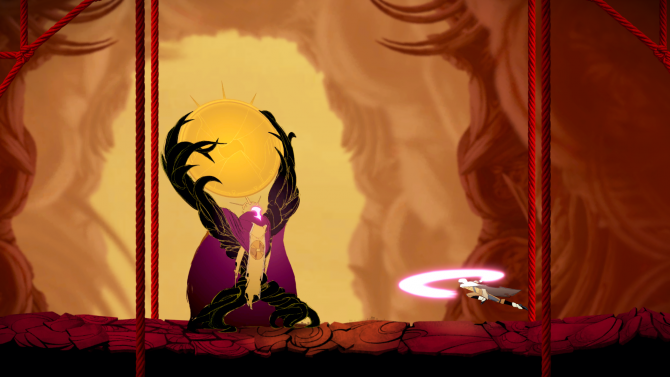 Sundered makes it very clear from your very first moments in your very first life that you are going to take a beating. You and your teammates will die early and often, but if you can endure, then you be will rewarded with some of the deepest sighs of relief and accomplishment you will feel in a co-op title. 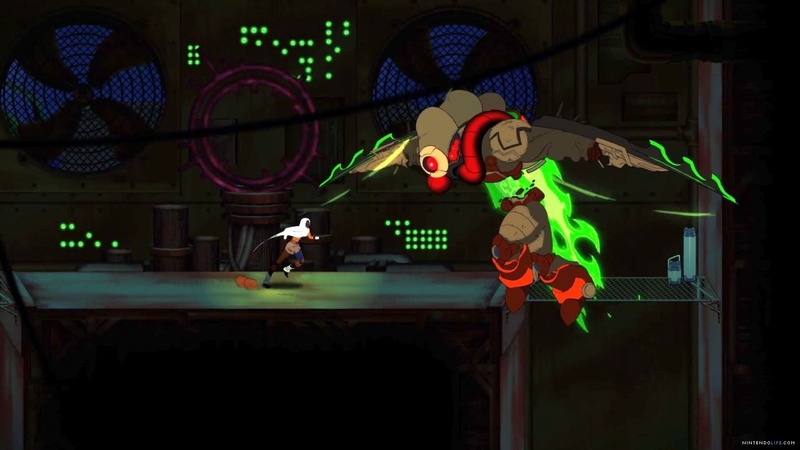 As the original edition of Sundered did not feature co-op, this review is exclusively for Sundred: Eldritch Edition which has added local co-op play for up to four players. Sundered is a roguelike, side-scrolling platformer game that drops the player into a spanning dungeon-world where the game takes place. With hardly any abilities for navigation or combat, and without any inkling of what to do or where to go in order to progress (the only direction is given from a creepy and omnipresent voice that seems fascinated with the idea of corrupting everything in the game world), the players begin climbing and crawling through procedurally generated and randomized rooms, fighting for their lives at every turn with the game promising that they are going to die - a lot. In Sundered: Eldritch Edition, players move through randomized rooms collecting shards. Shards are often found in different canisters, chests, and containers throughout the world and are used to upgrade abilities and make the player’s character more than a punching bag for the varieties of bad guys. As all co-op partners use the same ability tree, it’s up to Player 1 to decide if the party would benefit from spending the shards on different upgrades. The ability tree has two main components: Perks that are a rare find in combat or treasure chests, and shard-consuming Upgrades. The effects of Perks change gameplay elements with a risk/reward system, such as drawing shards in from a further distance, but slowing shield regeneration speed, or increasing enemy difficulty, but yielding more shards. These can be turned on or off from the game’s hub at the player’s discretion. Upgrades, on the other hand, include things like increases to melee damage per strike, chances of critical hits, and health, remaining on after they are purchased by the player. I would elaborate further, but discovery is one of the most powerful pieces to the game. Navigation and exploration are what players will be doing the most in Sundered. Whether it’s looking for shards in chests, trying to navigate terrain puzzles, or trying to unlock a hard-to-access room, the act of getting from point A to point B will take most of the player’s time in game. However, the most frustrating aspect of navigating for all players, especially early on when health reserves are low, are the environmental hazards that deal oddly high amounts of damage. In a world where creepy crawly evils wait around every corner, dying numerable times due to dangerous bushes did more to frustrate us rather than keep anyone on their toes when traversing the environments. After navigation, combat is the other major component in Sundered. Combat begins with simple sword swings and dodges, but eventually progresses by adding different movements and powers such as a cannon for ranged attacks and powerful finishers that become vital to the players’ survival. The biggest thing that sets Sundered apart from other roguelikes are the ‘hoards’ of nightmare-inducing bad guys that show up to assault players. Will you and your partners try to survive the masses of baddies through combat, or will you take off running (as escaping is a viable option as well)? With more players the damage that can be doled out increases dramatically, so standing your ground to fight off the onslaught of evil is far easier when there is a team of heroes rather than a sole survivor. The major issue with combat is the swarms never seem to have rhyme or reason before they attack. You will go some runs where you amass piles of treasure while encountering minimal resistance, and other times you will enter into the game world only to be killed extremely quickly due to no fault of your own; it was just time for a hoard to come. The frustration here is usually video games set up rules in the world they create and then ask the player to survive inside of those rules. With Sundered, there appears to be no reasoning as to when the evil armies will show up and attack players, so it never feels like an established set of rules that the game or player is playing by. This unpredictability is set up to push the players to progress and level up, but often becomes more frustrating as progress the game world is snatched away through no fault of the player. Even with all of the problems in combat, Sundered also has some of the most epic and creepy boss fights in a co-op game - period. These fights are constantly pushing the abilities of your party to their limits with intense combat. Discovering these fights and slowly working out how you will best these terrifying encounters is absolutely one of the highlights of the entire time spent in Sundered. There were numerous times that, after a tooth and nail battle with a big baddie, my party and I would break into cheers and applause upon delivery of the final blow. These boss battles are intense, extremely memorable, and absolutely a highlight of Sundered, especially when you take friends in to withstand the pressure with you. These large-scale sequences that land very well for co-op are truly unforgettable, but there is more to this game than those moments alone. Despite great co-op magic in the boss fights, there are some elements of Sundered that aren’t as fun. Combat and navigation each have a specific issue that impacts co-op in an adverse way. 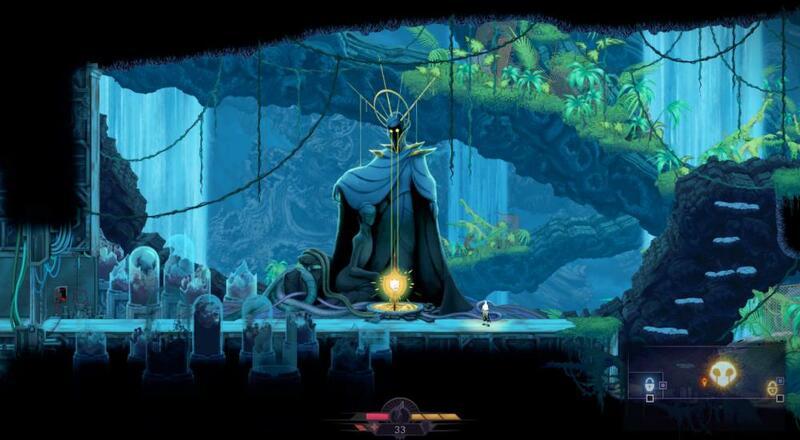 For navigation, there is a teleport ability that is given to Players 2, 3, and 4 that places a glaring light on the first problem with Sundered’s co-op: everything is tied to Player 1. When navigating the world, if Player 1 wants to go faster or go in a given direction, it is of their volition that the group moves. Pair with this the fact that only Player 1 gets to pick the Upgrades and Perks, as previously noted, and the other players can be left feeling less like main characters and more like party extras. As the game progresses into more combat-heavy portions, Sundered requires players to frequently fight or flee, and if Player 1 wants to flee, the party can be left feeling as though they have to follow suit rather than all members of the party having equal say. The same problem with equal voices in co-op is found in combat too, as the button that causes teleportation for Players 2, 3 and 4 is the button for Player 1 that uses a health pack. This means if all other Players are taking a beating, it still comes down to Player 1’s discretion whether or not the party should use a health pack to save a teammate, as the health impacts all players. Sundered: Eldritch Edition conveys two very different feelings as it adds co-op. Navigation feels like co-op was simply added after the fact without much regard for how the game would play and control with multiple players. However, combat and boss fights are so intense and captivating that just being able to party up with friends to experience the nail-biting, edge-of-your-seat thrill of killing horrifying monsters together makes Sundered: Eldritch Edition worth playing with others. The Co-Op Experience: Up to four players can play together locally to explore the depths of the caverns and resist or embrace the Eldritch horror.